The V-2 known as the A4 was the world's first operational liquid fuel rocket and was the starting point for modern rocketry. The name Bumper was given these these early rockets to draw attention away from the German name of V-2. 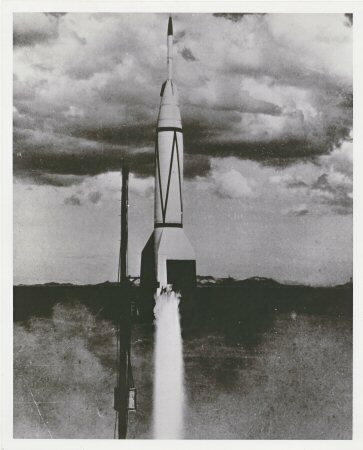 The First Rocket Launched From The Cape. A wonderful ground level view of Bumper #8 as it lifts off from Pad 3 at Cape Canaveral. 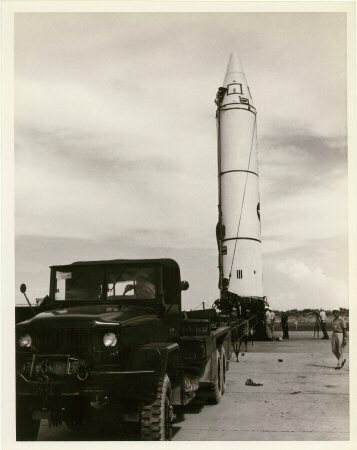 The very first rocket to be launched from the Cape. 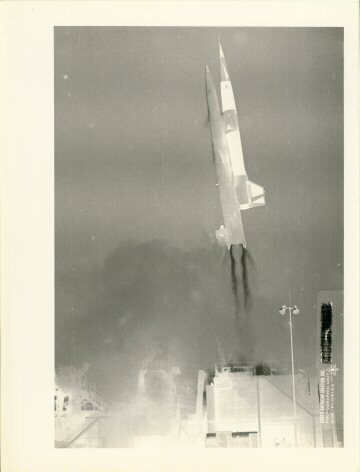 All other test were carried out at White Sands before this V-2 rocket test. Bumper #7 was scheduled to be the first but it failed at ignition and was rescheduled after Bumper #8. 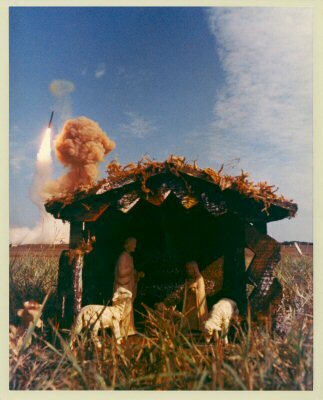 The Army-JPL Wac Corporal (Bumper#8), was fired from the Long-Range Proving Ground at Cape Canaveral at a very low angle of attack. The first-stage V-2 climbed 16 km before it exploded. The second-stage Corporal separated successfully, however, and travelled another 24 km. A fantastic view of Bumper #8 as it lifts off from Pad 3 at Cape Canaveral. The camera men in the lower foreground are a added bonus to this historic view. The very first rocket to be launched from Cape Canaveral. 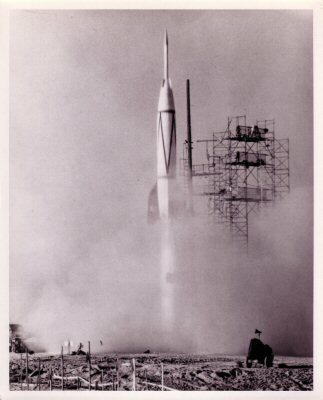 All other test were carried out at White Sands before this V-2 rocket test. Bumper #7 was scheduled to be the first but it failed at ignition and was rescheduled after Bumper #8. 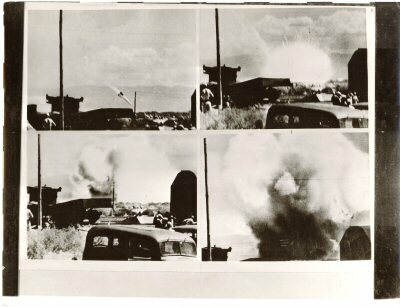 A outstanding 4 pane sequence of a V-2 rocket on the flight and crash at White Sands, New Mexico. Technicians had hoped it would reach an altitude of 123 miles from starting point at the White Sands Proving Grounds. After going out of control at about 1,000 feet the rocket hurled to the ground and exploded. The control crew did manage to guided the missile to a harmless destruction. This vintage NASA glossy photograph is in good to fair condition. 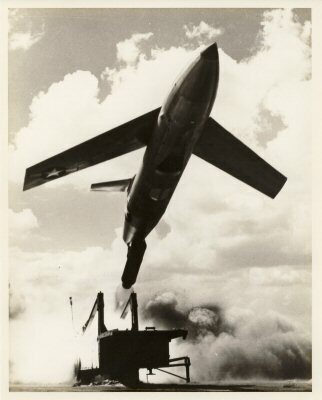 The Bomarc was the only surface-to-air missile ever deployed by the U.S. Air Force. All other U.S. land-based SAMs were and are under the control of the U.S. Army. Bormarc we the only surface-to-air (SAM's) rocket used by the US Air Force and all other SAM's were used and controlled by the Army. 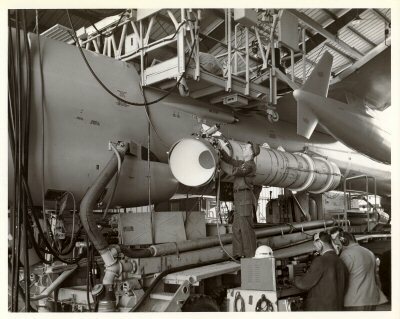 Boeing started studying surface-to-air guided missiles in 1946 along with the US Air Force and the first project was noted as MX-606. By 1950 Boeing and the USAF had test launched over 100 rockets. In 1949 Boeing received a contract from the USAF to develop a pilotless guided missile to be used as a interceptor. 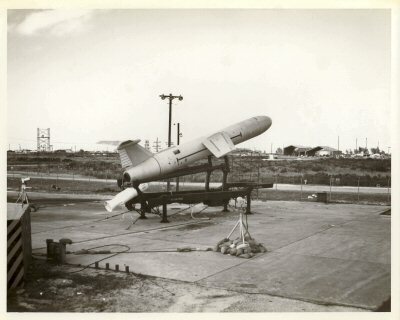 Project MX-1599 produced the MX-1599 a ramjet-powered nuclear long range surface to air missile. 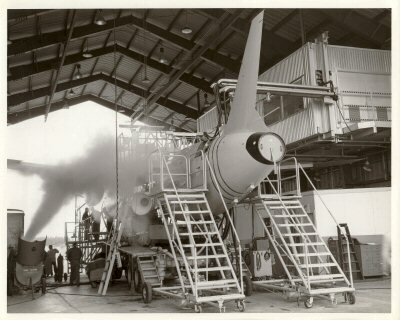 Michigan Aerospace Research Centre (MARC) joined the project where it got the name Bormarc. BO for Boeing and MARC. 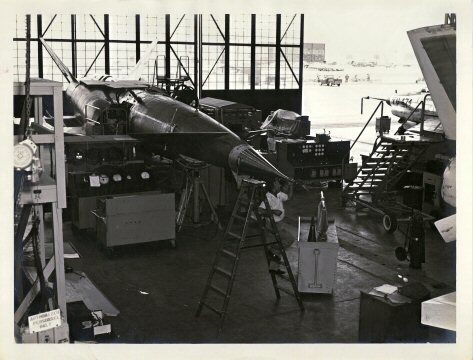 In 1951 the USAF designated the BOMARC as the F-99. 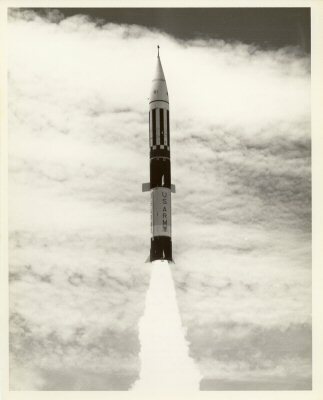 The Bomarc 624 XY-1 is seen as it lifts off from Launch Complex 4 at the Cape. 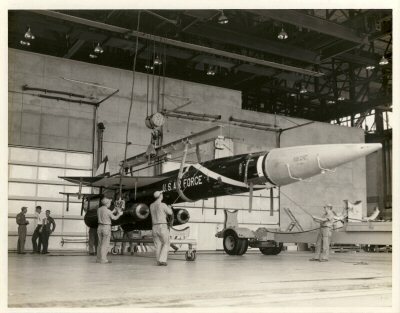 This was the first launching of USAF Bomarc interceptor missile from Cape Canaveral on a signal sent by the SAGE Control Centre at Kingston, N.Y. This fine vintage USAF glossy photograph is in very good condition. 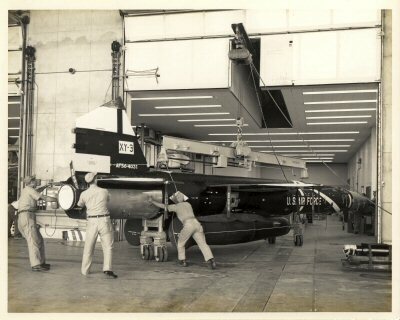 Ground crew are seen preparing the Bomarc 624 XY-3 to be moved from its work stand exerciser in Hangar I to Launch Complex 4 at the Cape. The XY-3 was launched from Pad 4 on September 3, 1958 and was the third launching of USAF Bomarc interceptor missile from Cape Canaveral on a signal sent by the SAGE Control Centre at Kingston, N.Y. 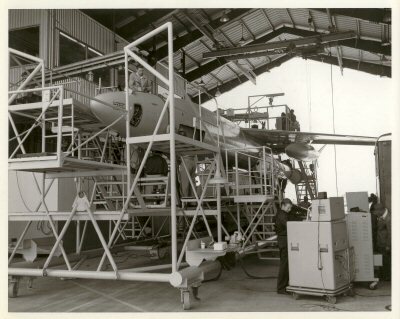 Ground crew are seen lifting the Bomarc 624 XY-3 from its work stand exerciser in Hangar I and will place it on a transporter to take it to Launch Complex 4 at the Cape. 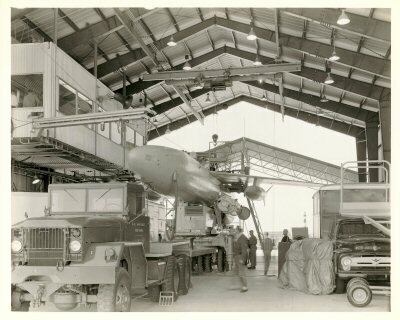 Ground crew are seen moving the Bomarc 624 XY-3 from inside Hangar I and are positioning it in the loading area so it can be lifted onto a transporter that will deliver it to Launch Complex 4. 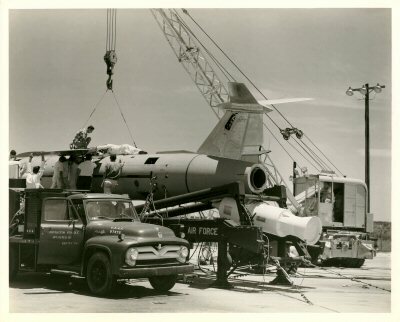 Ground crew are seen lifting the Bomarc 624 XY-3 for loading onto a transporter that will deliver it to Launch Complex 4. 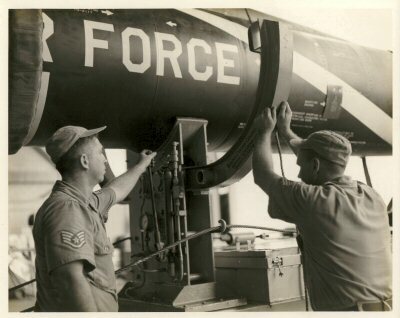 Air Force ground crew are seen during field missile processing for the Bomarc 624 XY-4. 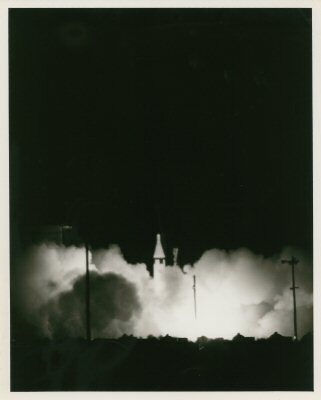 An operational test launch on 21 October 1958 from Pad A of Launch Complex 4 was logged as successful with apogee of 12 miles. 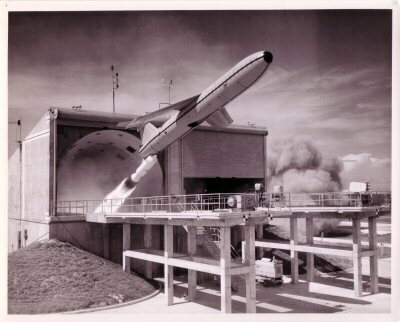 The Army's Redstone Arsenal was started with the Jupiter program as early as 1954 as a 1000 mile range missile and the development of the PGM-11 Redstone IRBM. The Jupiter was developed for the US Army but by the time the it was completed it was reassigned to the US Air Force. 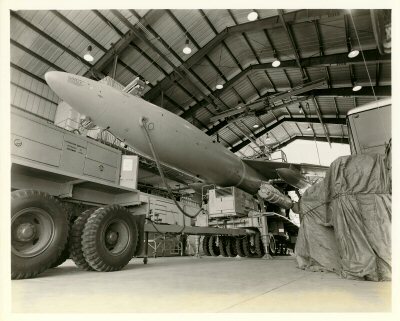 The Air Force stationed the Jupiter IRBM's in Turkey and Italy in the early 1960's. After the Cuban Missile crises they were withdrawn as a deal with Russia in exchange for the removal of the Soviet R-5 missiles from Cuba. The Apollo Saturn I launch vehicle used Jupiter's engines and tooling as did the Juno V.
Pre-launch activity at Launch Complex 26A for the Redstone CC-2004. 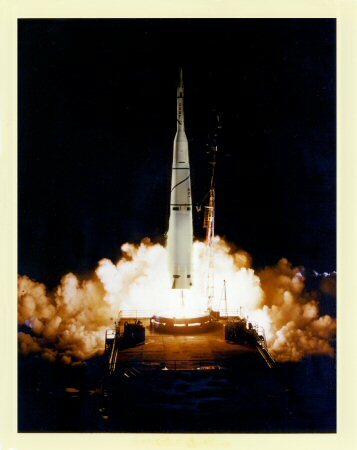 Launch occurred on 5 August 1959 and a pre-launch tanking error caused a early engine cut-off because of fuel depletion. The flight was logged as a missile test failure as the Jupiter A/Redstone only reached a apogee of 55 miles and missed its aimpoint by 2,707 miles. 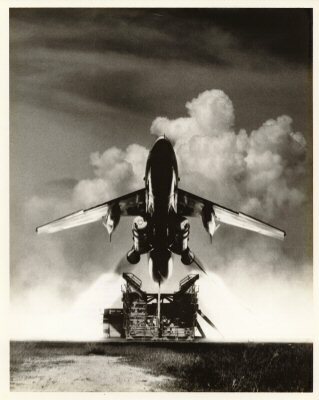 This very fine vintage USAF glossy photograph is in near mint condition. 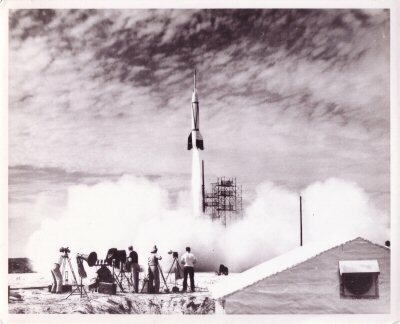 Pre-launch activity at Launch Complex 6 during Loxing of the Jupiter AM-24. The primary mission of impacting the nose cone in a pre-calculated target area was successfully accomplished. The missile covered a pre-calculated range of 1,299.4 nm, with the nose cone impacting within 1.25 nm of the predicted point. In addition to the usual ST-90 Stabiliser Platform, the missile carried a second system for relative accuracy and for drift investigations. It also housed a telemetry system to determine environmental flight conditions. 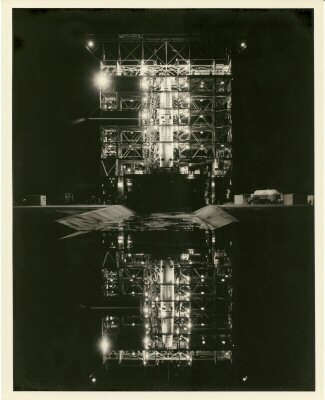 Here is a wonderful vintage view at Launch Complex 26 as the Jupiter IRBM CM-217 is erected on Pad A of the LC. 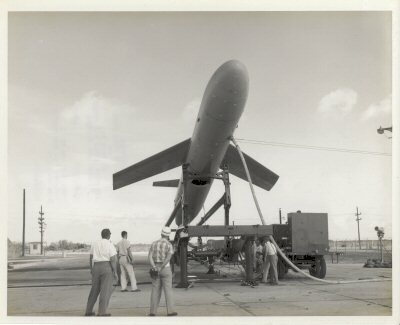 Jupiter missile Live System Test 217, the first to be fired under simulated tactical conditions using GSE prescribed for the Jupiter deployed to NATO I, was fired from AMR at 1102 hours EST 20 Oct. 1960. The missile successfully accomplished all primary and secondary missions. The nose cone impacted 1.1 nm over and 0.2 nm right of the pre-determined target 962.5 nm downrange. 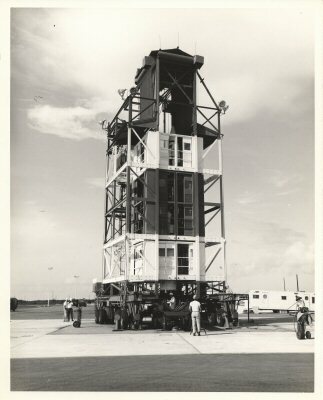 Another fine vintage view at Launch Complex 26 as the Jupiter IRBM CM-217 is erected on Pad A of the LC. The rocket is completely erected and the service petals have been set into place until launch day. Jupiter combat training launch by NATO Missile Crew. 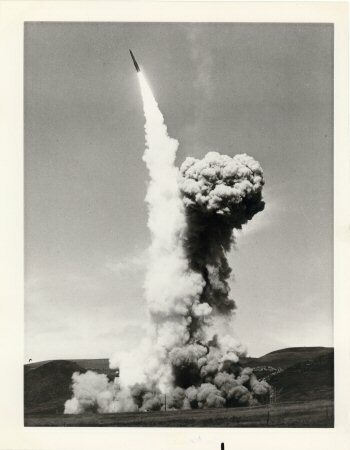 Combat Training Launch fired from the Cape's Launch Complex 26A at 1317 hours and 54.1 seconds EST to a predicted impact point of 1,514 miles from the firing site. All functions of the flight were normal up to 153 seconds, at which time fuel depletion was reached and normal guidance cut-off was not achieved. The missile impacted approx. 230 miles short of the intended target. 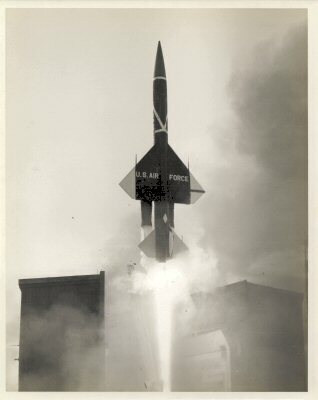 After WW II the Martin Co. was given a contract to design and develop a short-range surface-to-surface (SAM) rocket. The USAAF project MX-771produced the Matador and was named the SSM-A-1 but was hardly ever used. 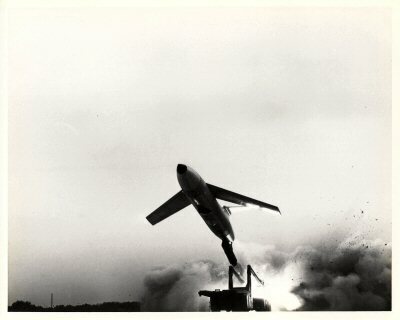 The first test flight was a dummy missile that was made from wood to test the launching system. 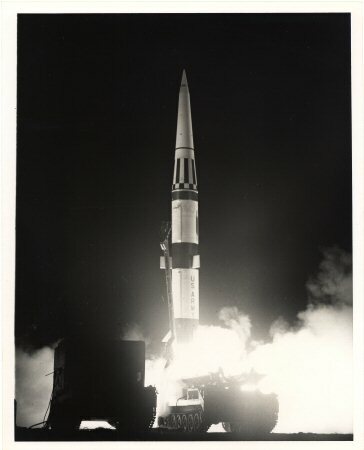 On January 20, 1949 the XSSM-A-1 was launched from White Sands Missile Range to test the guidance systems. The Matador program was almost cancelled but because of the Korean War the USAF continued with the project and gave it top priority. The MACE was a spin off development of the MATADOR and had a better radio-controlled guidance system and a redesigned airframe with smaller wings and longer fuselage which increased it range potential. 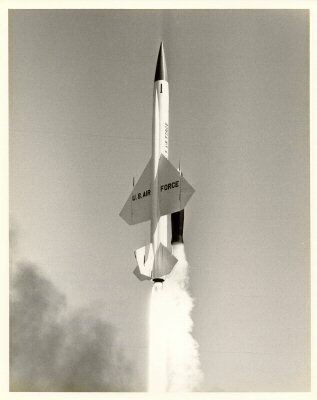 Launch of the USAF Matador Training Missile. Lunch of the Matador Training #4 from the Cape. 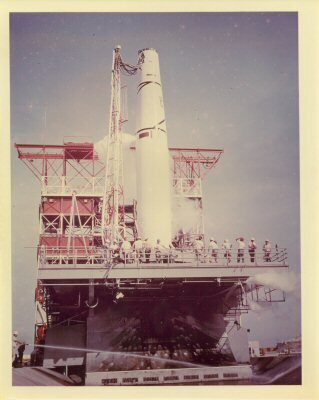 Pr-launch of the Mace 57-2445 from Launch Complex 22 at the Cape. Apogee 12 km (7 mi). 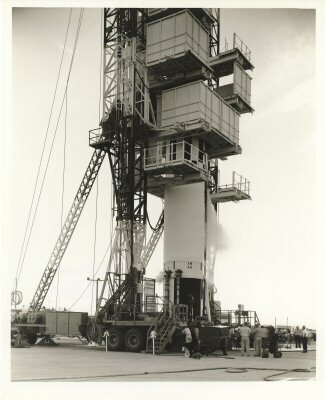 Pr-launch of the Mace 58-1391 from Launch Complex 22 at the Cape. Apogee 12 km (7 mi). 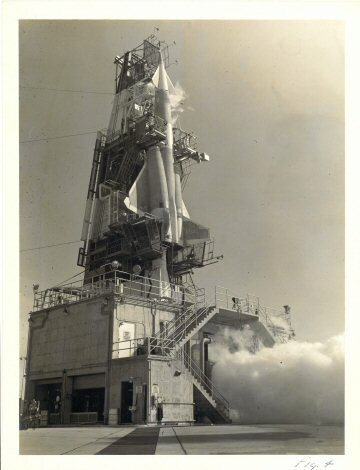 Pr-launch activity of the Mace 56-2898 on Launch Complex 22 at the Cape. The Mace 56-2898 was launched from Pad 22 on June 24, 1960. Apogee 12 km (7 mi). 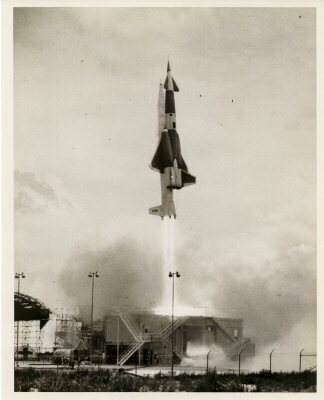 The final Research & Development test flight of the Mace TM-76B is seen being launched from the Cape's Pad 21. The final Mace TM-76B development flight covered 1100 miles. This fine vintage USAF glossy photograph is in very good condition and has two very small pin holes in the upper corners. It turned out that mastering the guidance and materials technology needed for a Mach 3 cruise air vehicle was actually more difficult than for a Mach 22 ballistic missile. In the end, the Redstone, Thor, Jupiter, and Atlas rockets were flying before their equivalent-range Navaho counterparts. However the Navaho program provided the engine technology that allowed the US to develop these ballistic missiles rapidly and catch up with the Russians. Navaho also developed chem-milling fuel tank fabrication techniques, inertial and stellar navigation, and a host of other technologies used in later space vehicles. It put North American Aviation, and its Rocketdyne Division, in a leading position that allowed them to capture the prime contracts for the X-15, Apollo, and Space Shuttle projects, thereby dominating American manned space-flight for the next seventy years. Navaho launch complex 9. The complex was built to support the Navaho winged intercontinental missile program. The Air Force accepted both sites 9 and 10 on 29 June 1956. 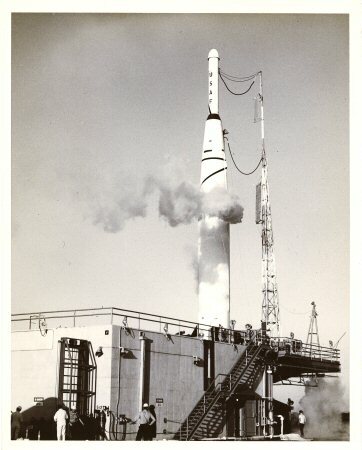 Complex 9 and 10 supported its first Navaho launch on 6 November 1956. In all, 11 Navaho XSM-64 vehicles were launched from the sites. Both complexes were demolished in 1959 to make room for Minuteman complexes 31 and 32. 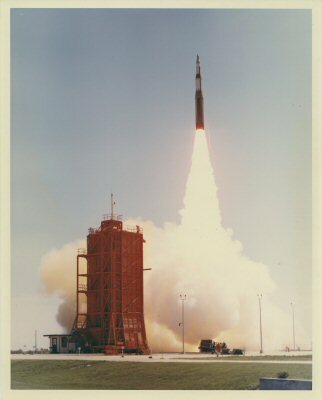 The Navaho II G-26 SM-64 Booster 003 s/n 210989 during Static Firing Test on Launch Complex 9 at the Cape. 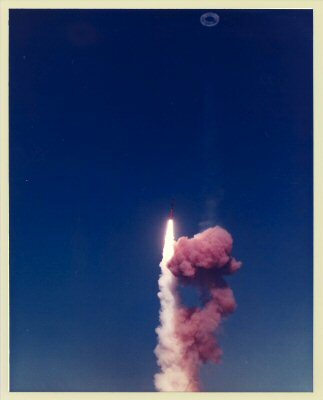 This is one of just a very few photographs taken at LC-9 during Static Firing Tests. This fine vintage USAF matt finish photograph is in very good condition. 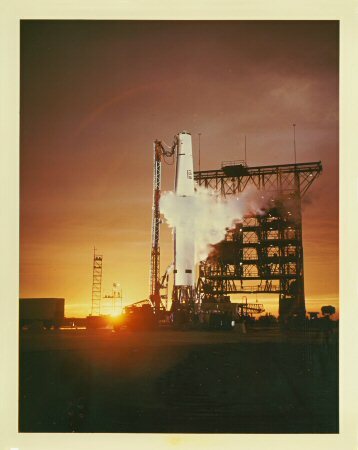 Here is a fantastic twilight view of the very first Navaho - G-26 SM-64 - Booster 003 - s/n 210989 on the launch pad at the Cape's Launch Complex 9. The Navaho II G-26 SM-64 003 s/n 210989 - The very first Navaho launched on 6 Nov. 1956 from Launch Complex 9 at the Cape. Apogee 2 km - Failed. The Continuing problems with APU reliability delayed the launch to November. Various problems extended the countdown from the planned 7 hours 30 minutes to 14 hours 30 minutes. Successful launch, then vehicle pitched up and disintegrated 26 seconds after launch, impacting 4 km down range. It was found the pitch rate gyro had been installed backward. A 8.5x11 b/w glossy photo will go with this one. Its has 3 small views of this Navaho in flight just before it disintegrated and one after it pitched. This fine vintage USAF matt finish photograph is in good to very good condition. 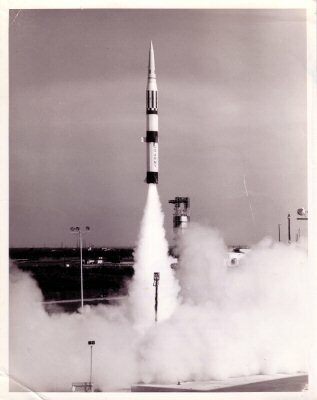 The Navaho II G-26 SM-64 Booster 006 s/n 210990 - The second Navaho launched on 22 March 1957 from Launch Complex 9 at the Cape. Apogee 9 km - Failed Stage 1. This fine vintage glossy USAF photograph is in very good condition. 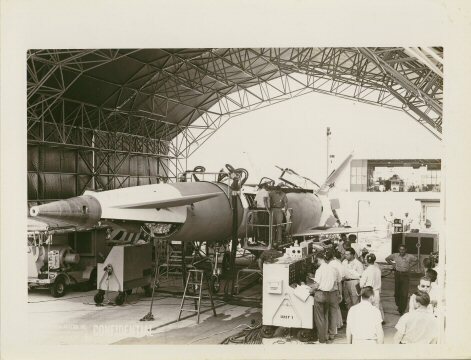 The Navaho G-26 SM-64 Booster #008 s/n 38270 during Navaho cruise missile preparation under the weather shelter, just prior to missile mating to Booster 008. 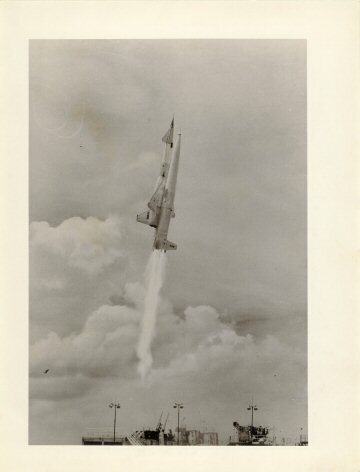 The Navaho G-26 SM-64 Booster #008 s/n 38270 lifts off from Launch Complex 9 at the Cape. Apogee 12 km (7 mi). The Navaho G-26 was a test version of the operational Navaho G-38 which would have been the fulfilment of the A-9/A-10 concept. Navaho was cancelled due to the success of faster, unstoppable ballistic missiles. But the engines, missile frame manufacturing techniques, inertial and stellar navigation equipment, and telemetry/guidance techniques developed for Navaho established the technical basis for all subsequent US rocket developments. The engine developed for an earlier version of Navaho was used in the Redstone rocket; that developed for the G-26 booster was used in the Atlas A and Atlas B ballistic missiles. The Navaho program was cancelled on 13 July 1957, but the already-built G-26 test missiles were flown to the end of 1958. 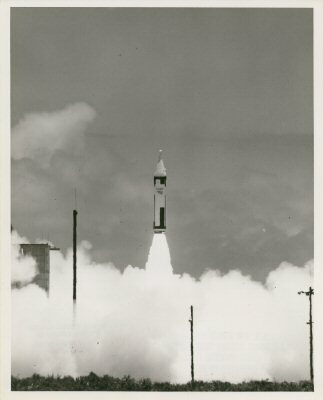 The Navaho G-26 SM-64 Booster # 008 s/n 38270 lifts off from Launch Complex 9 at the Cape. Apogee 12 km (7 mi). 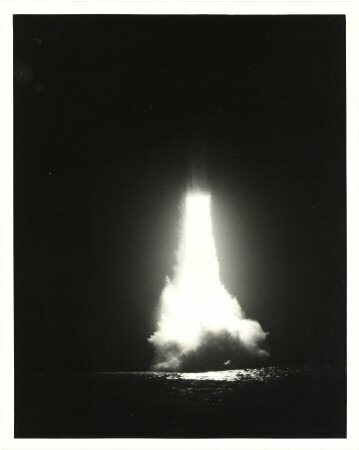 The missile launched from the repaired LC-9 on the third attempt. At T+42 seconds, Mach 1.63, and 7,000 m altitude, a fire occurred in the engine compartment after a failure of a regenerative cooling valve to the gas generator. The turbo-pump shut down, and one engine went out. Nevertheless the vehicle continued, first on one engine, then coasting, to 12,000 m altitude, and the booster separated successfully. But the cruise stage was below ramjet ignition velocity. Again ground control could bring the cruise stage under control as a glider, flying it to an impact 87 km downrange. Just no way to tell for sure which Navaho this one is in a hangar at Patrick AFB. The Minuteman missile system's carefully-designed, low-profile appearance only underscored its top-secret importance to national security. For almost 30 years, Minuteman missiles served as an integral component of America's nuclear triad of land-based ICBMs, submarine-launched missiles, and manned bombers. Although never launched against an enemy target, the Minuteman weapon system's ability to unleash apocalyptic destructive power at a moment's notice made "hot war" unthinkable — and protracted the standoff of the Cold War. In 1961, the US Air Force began constructing 1,000 Minuteman ICBM missile sites in America's heartland. Dispersed in underground silos throughout the central United States, Minuteman missiles were inconspicuous, silent sentinels on the Nation's rural landscape. Casual observers, including the thousands of tourists who annually travelled along Interstate 90 in western South Dakota, could easily have overlooked the antennas and security fencing that were the only "topside" signs of the below-ground, nuclear-tipped missiles. A fantastic colourful view of the Minuteman 1A 410 as it lifts off from Launch Complex 31B at Cape Canaveral. The trade mark smoke ring can be seen at the top of the photograph. This research and development flight reached Apogee 1300 km. 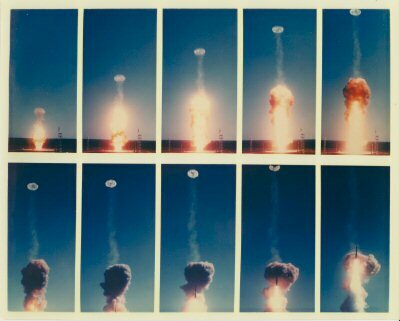 A wonderful 10 frame launch sequence of the Minuteman 1A lifting off out of the silo of Launch Complex 31B at the Cape. From the first puff of its familiar smoke ring shooting out of the silo to a clear view of the missile lifting off above its vapour cloud. This fine vintage colour glossy USAF photograph is in near mint condition. Printed on heavy 'A Kodak Paper'. Here is one you will not see very often. 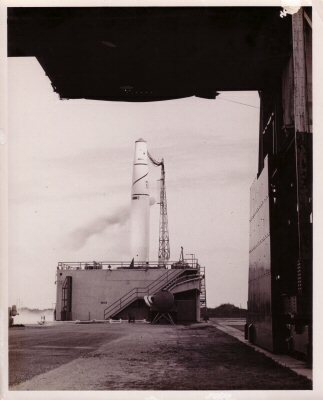 The Minuteman 1A lifting off out of the silo at Launch Complex 31B at the Cape. 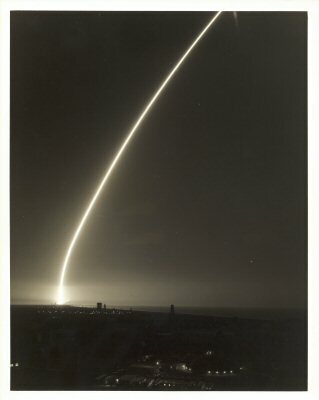 This was one of the four Minuteman 1A shots from the Cape in 1962. I wonder what the camera man was thinking having this religious icon as the foreground for a test flight of a missile of mass destruction lifting off. 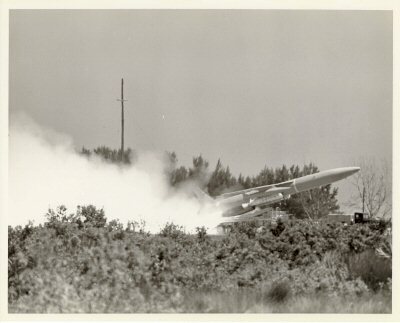 The first R&D test flight from Launch Complex 32B at the Cape for the much improved Minuteman 2. It had a new Aerojet General SR19-AJ-1 second stage motor that increased its range by 1600 km and a new guidance unit of solid-state circuitry that could store up to eight sets of target coordinates. Apogee 1300 km. This very fine vintage colour glossy USAF AFSC photograph is in near mint condition. Printed on heavy 'A Kodak Paper'. A Minuteman Missile streaks skyward. A striking view looking over Missile Row as a Minuteman Tactical Missile streaks overhead. The Pershing Medium Range Ballistic Missile (MGM-31), the only solid fuelled MRBM ever deployed by the US Army, has been used for 30 years until nuclear reduction treaties caused them to be phased out and destroyed. 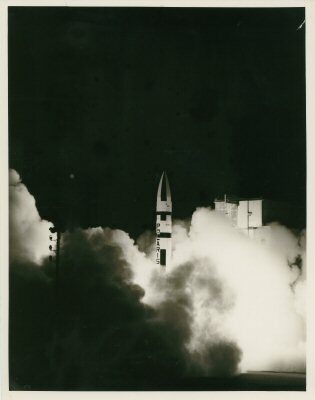 The Pershing I (MGM-31A) #108 is launched from Launch Complex 30A at the Cape. 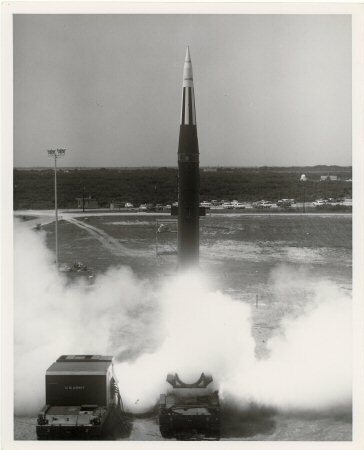 This is the 4th test launch of the Pershing I (MGM-31A) MRBM. Apogee 250 km (150mi). 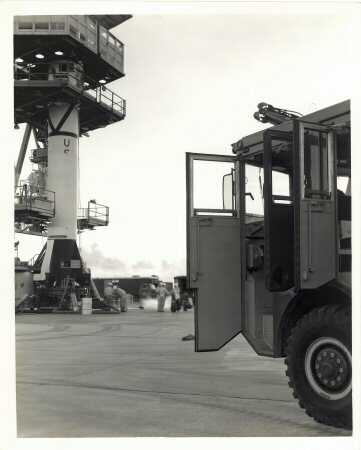 The Pershing I (MGM-31A) #109 is in the service gantry at Launch Complex 30A at the Cape. 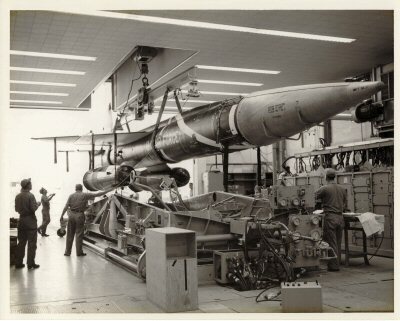 This will be the 5th test launch of the Pershing I MRBM. 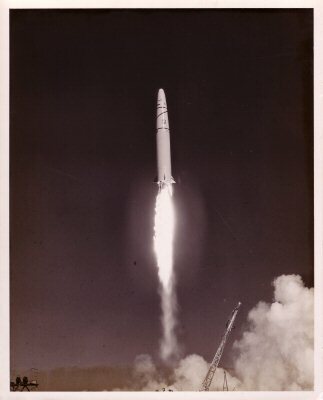 The Pershing I (MGM-31A) #109 is launched from Launch Complex 30A at the Cape. 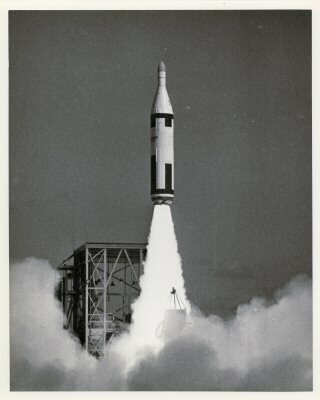 This was the 5th test launch of the Pershing I (MGM-31A) MRBM. Apogee 250 km (150 mi). 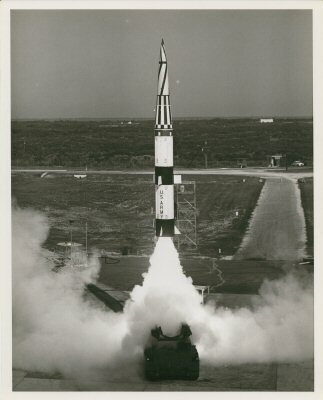 The Pershing I (MGM-31A) #206 is launched from Launch Complex 30A at the Cape. 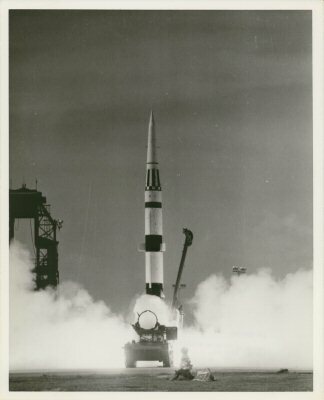 This was the 8th test launch of the Pershing I (MGM-31A) MRBM. Apogee 250 km (150 mi). This fine vintage USAF glossy photograph is in good condition. 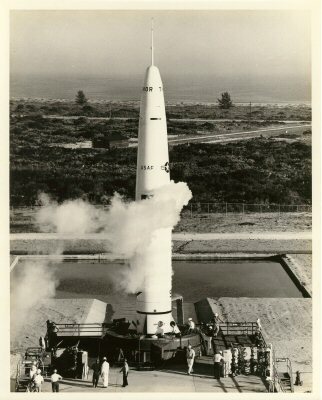 The Pershing I (MGM-31A) #308 is launched from Launch Complex 30A at the Cape. 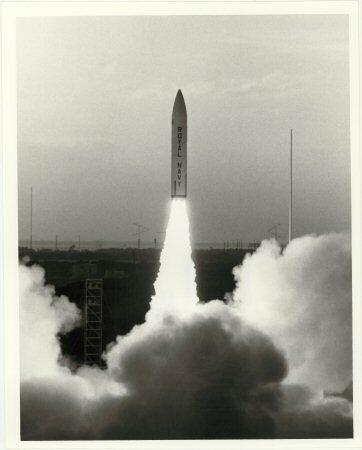 This was the 15th test launch of the Pershing I (MGM-31A) MRBM. Apogee 250 km (150 mi). This fine vintage NASA LOD glossy photograph is in very good condition, near mint. Army fired its Pershing solid-fuel tactical missile from Cape Canaveral's Launch Complex-30A on a 200-mile flight, testing accuracy, warhead components, and blast and heat factors at launch in relation to operational crew protection. This was the seventh straight successful firing of the Pershing. This fine vintage USAF glossy photograph is in poor to good condition as it has a few wrinkles that can be seen in reflected light. 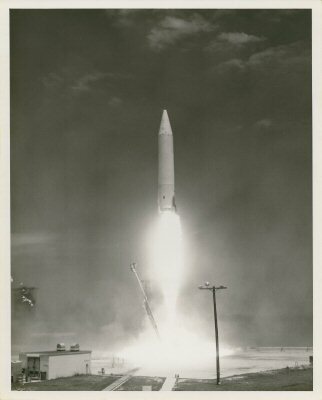 The Pershing I (MGM-31A) #335 is launched from Launch Complex 30A at the Cape. 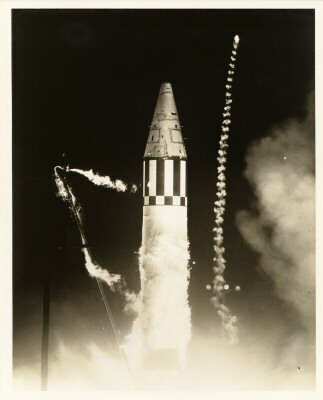 This was the 31st test launch of the Pershing I (MGM-31A) MRBM. Apogee 250 km (150 mi). 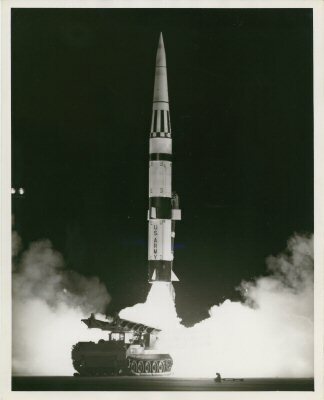 Pershing missile lifting off as seen at the Cape's Launch Complex 30. A fine vintage glossy photograph that I have not identified as yet. 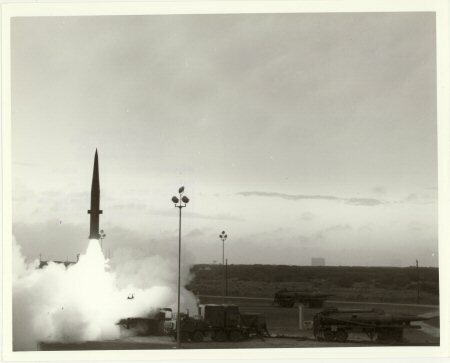 Beginning at 11:03 a.m., the morning of 25 April 1979, soldiers of the U.S. Army and Europe fired this one of three Pershing 1A Tactical Missiles from Launch Complex 16 at the Cape. Pershing missile and ground crew seen at the Cape. A fine vintage glossy photograph that I have not had the time to identify. 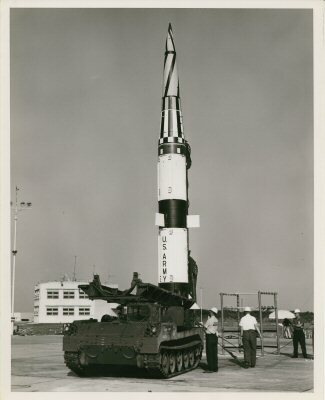 Pershing missile seen on its Tactical Mobile Launcher at the Cape. 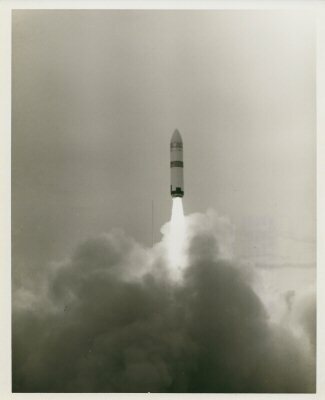 Pershing missile lifts off from Launch Complex 30A at the Cape. 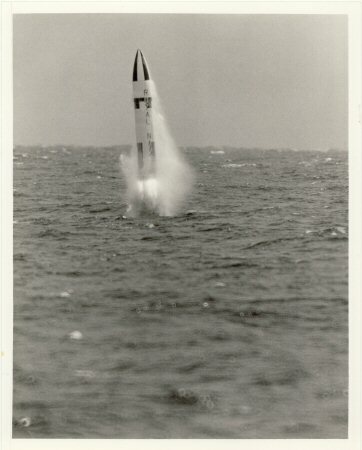 The Polaris was the first SLBM (Submarine-Launched Ballistic Missile) deployed by the U.S. Navy. Seen is the Polaris A1E-1 or the A1E-2 which was launched by the USS George Washington (SSBN-598) for the first successful underwater launch of the Polaris A-1 SLBM, Apogee 500 km (310 mi). 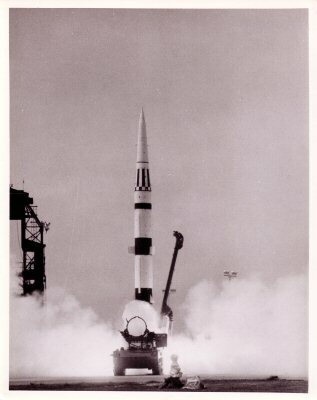 This Polaris A1 test vehicle was launched from Launch Complex 29 Pad A at the Cape on 10 February 1960 and logged as an operational test mission. Apogee 500 km (310 mi). 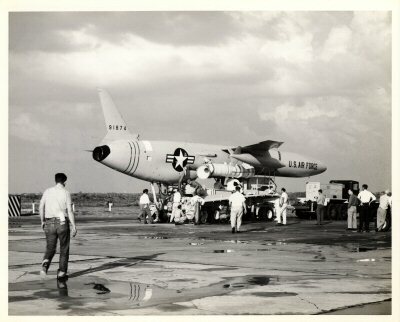 This Polaris A2 test vehicle carrying an instrumentation package in its nose cone was launched from Launch Complex 25A at the Cape on 3 May 1962 and logged as an operational test mission. 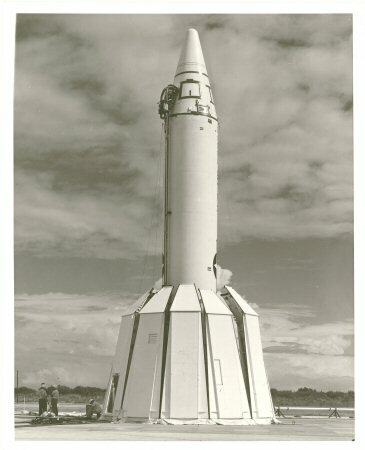 This Polaris A2 test vehicle carrying an instrumentation package in its nose cone was launched from Launch Complex 25A at the Cape on 4 June 1962 and logged as a failure. 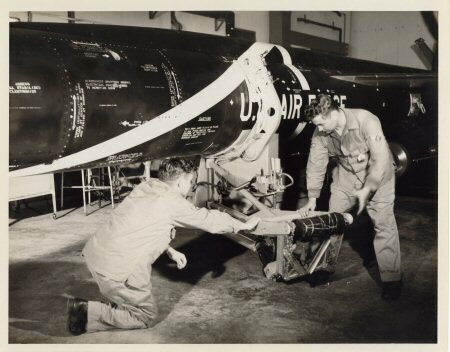 This fine vintage glossy USAF photograph is in good condition. 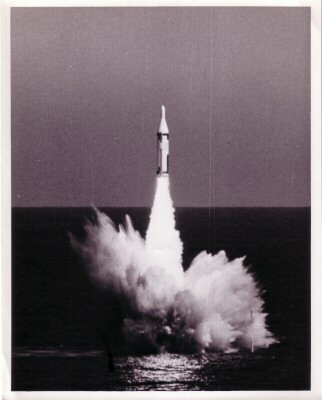 This Polaris A3 was launched from the Royal Navy's HMS Repulse S23 sub located in the ETR Launch Area about 30 miles off the coast from the Cape. 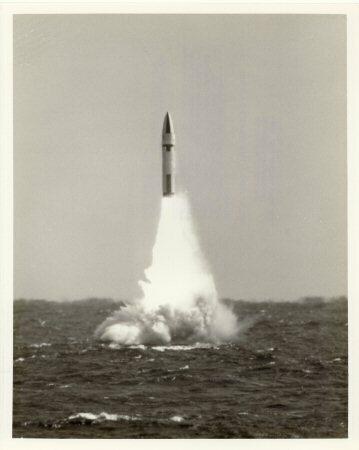 HMS Resolution S22 one of Britain's four Nuclear Powered Ballistic Missile Submarines fired this 2,880 Statue Mile Polaris A-3T Missile down the Air Force Eastern Test Range during a demonstration and shakedown operation held on Monday, 6 March 1972. The UK launched this Polaris A3 Missiles from Launch Complex 29A at the Cape on July 27, 1978. One in a series of Operational Test Launches scheduled to launch from the Cape and the ETR launch area about 30 miles off the Atlantic Coast from the Cape. The UK launched its 8th of a series of Polaris Missiles from a land pad at the Cape for the Royal Navy. 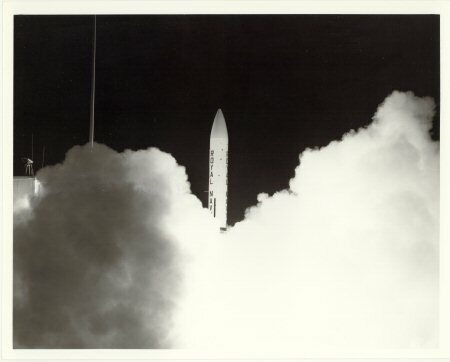 This Polaris A3 was launched from Launch Complex 29A at 5:00 p.m. EST on 8 November 1979. The UK launched its tenth of a series of Polaris Missiles from a land pad at the Cape for the Royal Navy. 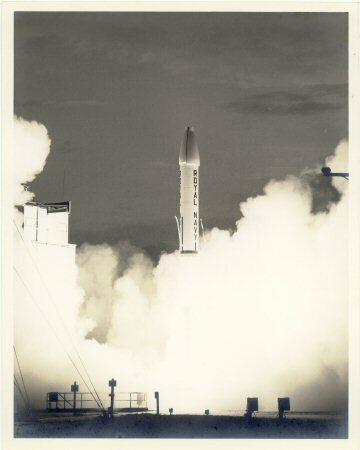 This Polaris A3 was launched from Launch Complex 29A at 7:15 p.m. EST on 10 April 1980. 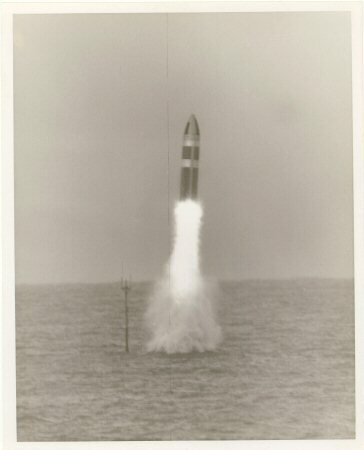 HMS Resolution (S22) one of Britain's four Nuclear Powered Ballistic Missile Submarines fired this Polaris A-3TK Missile in the ETR test rang a few miles off the Atlantic coast from the Cape. Another fine old glossy photograph that I have not had time to research to identify. This fine vintage glossy USAF photograph is in poor to good condition. Has a slight crease running across the top portion that can only be seen in reflective light. The Poseidon missile was the second US Navy ballistic missile system, powered by a two-stage solid fuel rocket. It succeeded the Polaris missile beginning in 1972, bringing major advances in warheads and accuracy. It was followed by Trident I in 1979, and Trident II in 1990. A development study for a longer range version of the Polaris missile achieved by enlarging it to the maximum possible size allowed by existing launch tubes started in 1963. Tests had already shown that Polaris missiles could be operated without problems in launch tubes which had their fibreglass liners and locating rings removed. The eleventh Poseidon missile lifts off from land at launch pad 25D at the Cape for its trip downrange. It was launched at 12:37 p.m. EDT. The 11th launch from land and the 13th R&D test flight. Apogee 500 km. This marked the seventh submarine launch of a Poseidon Fleet Ballistic Missile as it soars from the submerged USS Daniel Boon SSBN 629 in the ETR test area some 30 miles off the Atlantic Coast from the Cape. Very Common Angle Of The Trident Missile. This fine vintage NASA photograph is in near mint condition. 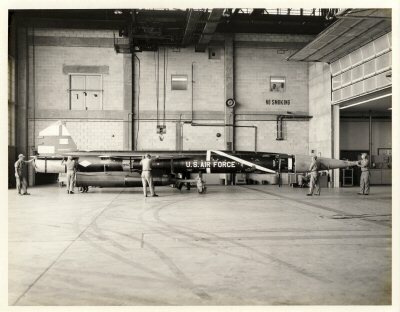 The Snark was the only intercontinental surface-to-surface cruise missile ever used by the U.S. Air Force. It was operational for only a very short time and was made obsolete by the new ICBMs. 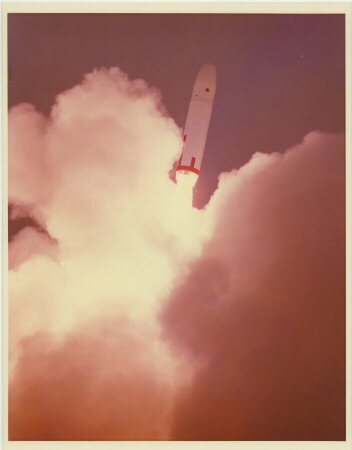 A haunting almost surreal view of the Snark N-3316 as it is launched from Launch Complex 2 at the Cape. Pre-launch activity in the shed at Launch Complex 2 at the Cape for the Snark N-3416. 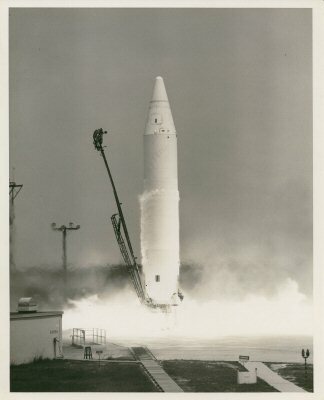 This test mission was launched on December 11, 1959 Apogee 10 km (6 mi). Pre-launch activity in the shed at Launch Complex 1 at the Cape for the Snark N-3425. 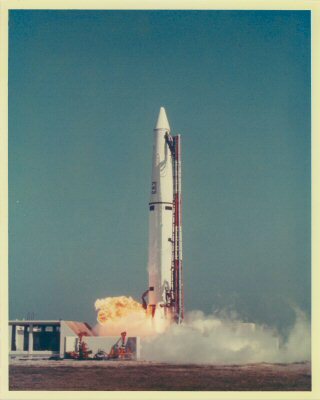 The Snark AM-62A N-3425 was launched on February 12, 1960 Apogee 10 km (6 mi). Pre-launch activity in the shed at Launch Complex 2 at the Cape for the Snark N-3427. 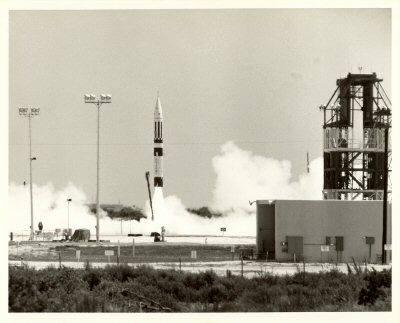 The Snark SM-62A N-3427 is launch from Launch Complex 2 at the Cape. Apogee 10 km (6 mi). Pre-launch activity on Launch Complex 2 at the Cape for the Snark N-3444. 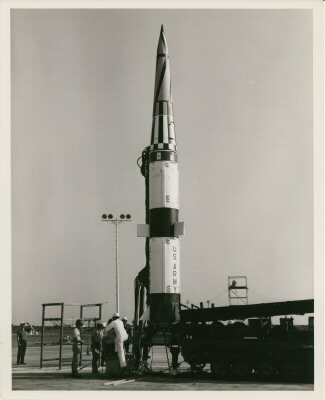 Thor was the first Intermediate Range Ballistic Missile (IRBM) deployed by the United States and had a very short military career. As it was a very reliable launch vehicle, its descendants are still being used today for launching various payloads into Earth orbit. Series I Research & Development Launch. 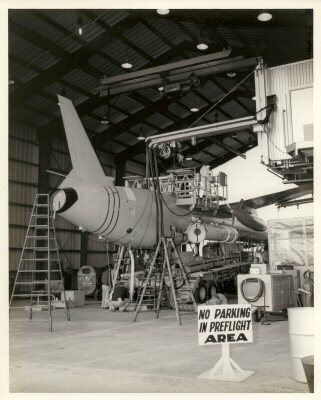 The first Douglas Thor Missile #101- R&D test #1 is seen during pre-flight preparations at Launch Complex 17B only 13 months after first production contracts were signed. This the first Thor Research and Development launch that took place on 26 January 1957 and the test was logged a failure. Because of Lox contamination the booster developed valve failure and after ignition this caused thrust decay and the booster settled back through the thrust ring. This started an oxygen fire and then a huge booster explosion. Research & Development Series II Test Mission. A fine lift off view of this Research and Development Series II Test mission. The Thor IRBM was successfully fired from Cape Canaveral, flew its prescribed course, and impacted in pre-selected area. However this test was logged as a failure. Research & Development Series II Test Mission with a copper heatsink nose cone. A outstanding view from under the service gantry of the this Thor DM18 at Launch Complex 17B. The lift off was on 28 February 1958 and the test launch failed. 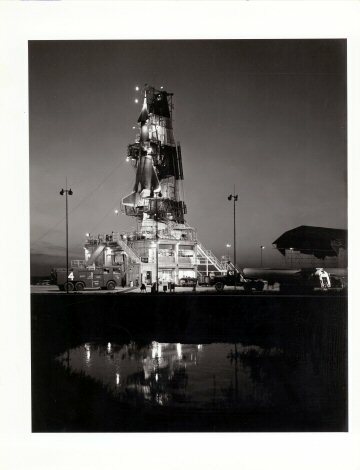 Here stands the Thor Able #116 on Pad A of Launch Complex 17 at the Cape. The Thor turbo-pump gearbox failed T+150 seconds after lift off and this Able RTV re-entry vehicle test flight is logged as a failure. This fine vintage USAF glossy photograph is in very good condition, near mint. Research & Development Series III Test Mission - Apogee 320 miles. A wonderful vintage scene of the Thor DM-18 #122 loxing on the pad at Launch Complex 17B at the Cape a couple hours before lift off. This R&D flight was logged as successful. Note one of the launch crew with the hose-pipe watering down the area seen in the lower left of the picture. Loxing or fuelling a rocket can be a very dangerous affair so water is used to help reduce the risk of a spark setting off the rocket fuel. This fine vintage high glossy USAF photograph is in very good condition. Series IV Research & Development Launch. A wonderful night view of the RVX-1 Re-entry Vehicle test with a AVCO Re-entry nose cone. Noted as a successful re-entry test flight that went 320 miles down range before re-entry. This very fine vintage high gloss photograph is in near mint condition. 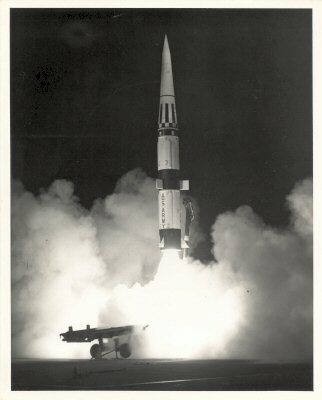 A successful series IV R&D flight with apogee of 320 miles on 22 March 1959. Launched from LC-18 at the Cape this Special Test Mission reached Apogee 520 km. This fine vintage colour USAF glossy photograph is in very good condition and printed on the heavy 'A Kodak Paper'. 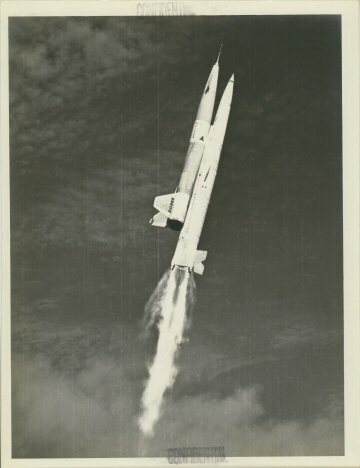 Thank you for viewing - I will be adding more Vintage R & D Rocket photographs soon.